In autumn deciduous shrubs lose their leaves and become dormant. The exact timing of this event depends on where you live and your weather. In the UK this is likely to be either October or November. Early autumn is the ideal time to take cuttings as there is a very high success rate. All you need is a bit of patience. 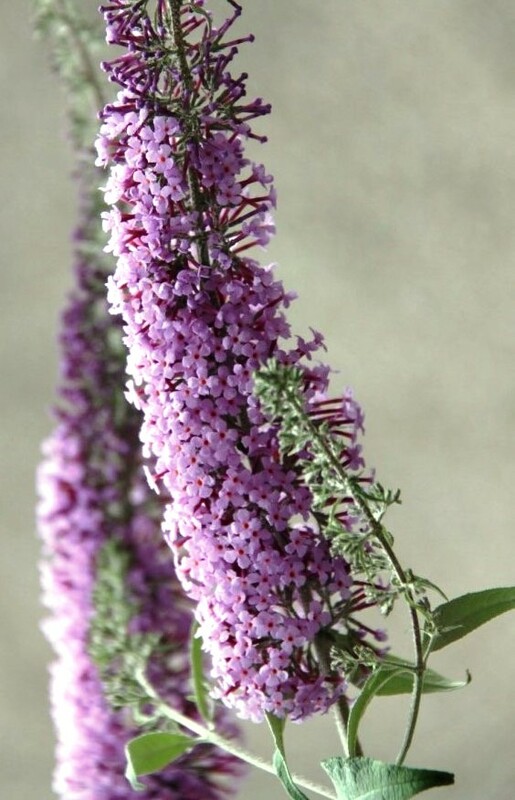 One of my Buddlejas is old and woody now so I’ve just cut it back hard and taken cuttings to give me some vigorous new plants for next year. Hardwood cuttings are so easy to take. Each year I take a few shrub cuttings to provide new plants for my own garden and to give away to family and friends. • Select a few vigorous healthy stems produced this year and cut them off the parent plant with secateurs. You’ll see that older stems are thicker much more woody… avoid these. • It’s easy to forget which end is the top of the cutting and you do need to be clear on this. One end will make roots and the other will produce shoots. To avoid confusion make a sloping cut at the top just above a bud and a straight cut at the bottom just below a bud. • Nurseries take large quantities of hardwood cuttings and root them in trenches outside. If you have space and can leave your cuttings undisturbed for a year then this is the best method. If not then you can root the cuttings in a deep pot of good compost. An old rose pot is ideal. Make a hole in the compost with a garden cane then dip the bottom of your cutting into hormone rooting powder to aid root formation. Firm the compost around each cutting with the cane. 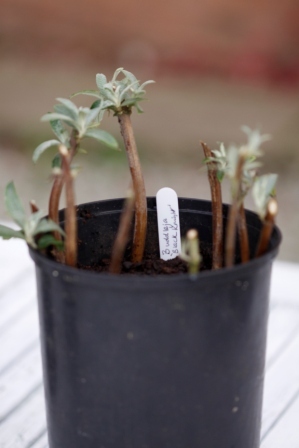 • Insert your cuttings around the edge of the pot making sure that two thirds of each cutting is covered with compost. Label with the date and plant name using a permanent marker. • Keep the pot in a cold frame or unheated greenhouse over winter. You’ll need to keep your eye on it to make sure that the compost doesn’t dry out. • Roots develop slowly over winter so be patient and you’ll see new shoots in spring which will indicate which cuttings have rooted. Your new plants can be separated and planted out the following autumn. 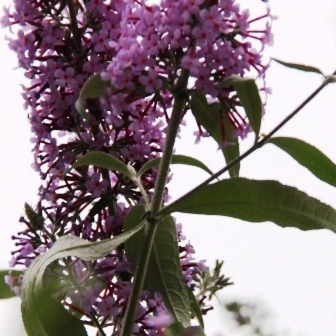 There’s no need to stick to Buddleja. Many other popular deciduous shrubs are suitable for this method of propagation. For example: Cotoneaster, Cornus, Ribes, Salix and Rosa. Why not have a go? If you’ve spotted a lovely shrub in a neighbours garden perhaps they’ll give you a few cuttings in exchange for a new plant next year.